The problem I have with BRUTAL YOUTH is its incongruous nature. At times, it reads like Young Adult, but its size and dark content pushes it into literary or adult fiction. Worse, those guest author blurbs. If you haven’t already, don’t read them! In the recent book THE STORIED LIFE OF A.J. FIKRY, they called these blurbs “the blood diamonds of the book industry.” Here, I can see why. Stephen King said this book had teachers that terrify; Gillian Flynn said it would be as “sharp as a well-carved stick”; James Dashner said my heart would ache at this “perfectly paced” novel; Jason Reitman said this would be “powerful and hilarious”. 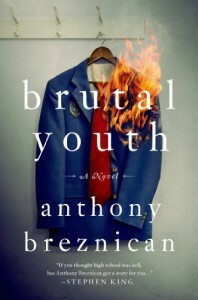 Then, underneath the title BRUTAL YOUTH is a picture of a school blazer aflame. My friends, the expectations are TOO HIGH! This happened last year when a huge chunk of money was paid to “the next J.K. Rowling” for a seven-book series beginning with THE BONE SEASON. (Hint: not on Rowling’s level.) In cases like this, you feel bad for the author. How can they stand up to this expectation? BRUTAL YOUTH is okay. It’ll actually make a terrific movie. The freshmen get hazed; many have heartbreaking backstories; the teachers don’t give a damn. If anything (and it is) the teachers are part of the problem. Things twist together, the youngsters crack, and it all ties together. It works. Besides the unrealistic set-up, the main issue I have here is the pacing. When I see fire on the cover and the word “brutal”, I expect high-impact pacing, but what I got was meandering. I could have put this book down and moved onto something else without needing to go back. Sure, each section ends with a bit of a drop and hook, but the middle parts wondered around. The solution: tighten it up and drop all the celebrity author endorsements. This isn’t as sharp as Flynn’s works, nor should she say it is. King has done much, much more terrifying stuff than this: no nightmares here. Let’s take this book at its own merit and enjoy it for what it is. Oh, and I can’t wait to see the movie. Thanks to St. Martin’s Press and Thomas Dunne Books for providing me with an electronic review copy of this book.